May 1, 2013 was just a normal day at work — or so I thought, until I got a phone call from a family member who told me that my father, Walter Schupp, Jr., had suffered a massive stroke and was in critical condition. I was in shock: He's only 47 years old! I rushed out of work and met him at Lehigh Valley Hospital-Cedar Crest, where he was being transferred. When I saw him, he couldn't speak, couldn't move anything on the right side of his body, and was highly cognitively-impaired. I was terrified, and it was difficult for me to even look at him. The doctors took me aside and told me that it didn't look good, especially since he'd had his stroke over six hours prior to being transferred. My family and I were left with a very important, life-changing decision. The doctors gave us two choices: Leave him on life support (in which case he would be a vegetable for the rest of his life), or have the doctors perform a highly risky procedure that wasn't recommended to be done past a certain amount of hours (and he far exceeded those hours). They told us that he may or may not make it out of the procedure alive, and that if he did make it out, they weren't sure if the procedure would even help. At that very moment, I felt like I had my father's life in my hands and I just didn't know what to do. I knew that he would never want to be a vegetable, yet I was scared that if I said yes to the procedure and he died, that would be on my hands. I would never be able to live with myself. With the help of my grandparents, we decided to give the OK for the procedure and hope for the best. Everything was so rushed that I barely even got a chance to say goodbye to him, and as he was rolled into surgery, I braced myself for the possibility that this could be the very last time we would ever see each other again. After hours upon hours of nervous anticipation in the waiting room, the doctor came out and told us that he made it through the procedure — but it was too soon to tell if it had worked. The doctors couldn't give us many answers or possible outcomes because all stroke patients are different. After coming out of his medically-induced coma, he slowly began to recognize me and other family members. He was still on life support at this time, but he could move his left side a little bit. He still couldn't move his right side at all, and the doctors said it was highly unlikely that he would ever walk again. I tried not to talk about my wedding — which was just one month away — while around him because I knew that he would be upset. Before the stroke, he always talked about how excited he was. One day, a family member started talking about my wedding while we were sitting by my father, and a tear trickled down his cheek; he had regained the ability to express emotions again. After about a week, his breathing tube was removed, and a physical therapist came into the room to see if he could talk or move. Still no luck, but he didn't give up. A few days later, I got a phone call that he was being transferred to the inpatient head trauma unit at Good Shepherd Rehabilitation. I was so excited, nervous, and hopeful that he may learn how to talk and walk again. 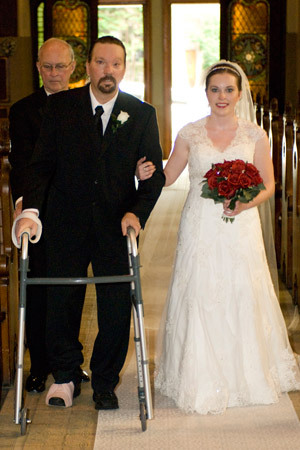 It was far from easy, but with the help and guidance from the staff members, he slowly began to say a few words and learned how to walk with a walker just days before my wedding. This was a miracle; he went from nearly dying to walking and talking a little bit in about a month! I got married on June 8, and I couldn't have been happier to have my father present and able to walk me down the aisle. Everybody was in shock to see him walking. 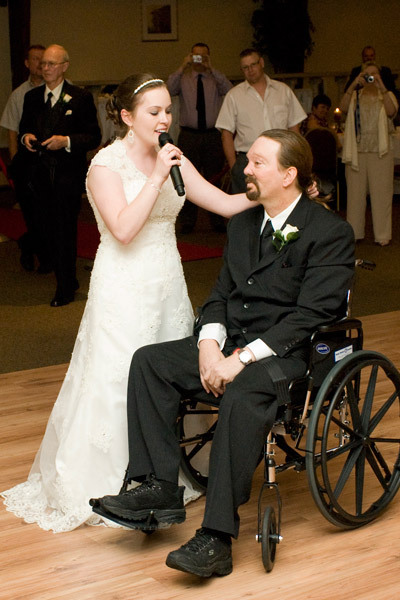 I believe that my father's sheer determination to walk me down the aisle — combined with the wonderful support of the rehabilitation team, of course — made it happen. At that point, walking was still fairly new to him, and every step made him exhausted. Instead of a father/daughter dance, I told everyone about his story and I sang "Through the Eyes of my Father." There wasn't a dry eye in the room. I was just so relieved that he was alive and amazed that he could not only attend my wedding, but also walk me down the aisle. To this day, he is still continuing to improve. He can now walk with a cane, go up and down stairs (with assistance), and has regained a lot of other abilities, including his speech. He's still getting treatment at the Good Shepherd Allentown outpatient facility, where with the help of the staff, he's making more and more progress each day.